1. Gender roles: The female protagonist Vespa does not take any of this gender role crap that New London tries to dish out. While Vespa is expected to get married, bear children, and work at home, she defies all expectations and works at a museum dedicated to Unnatural creatures. As a curator her job is considered "man's work", and she receives a lot of criticism for it. On the other hand, while author Tiffany Trent tries to create a girl that is completely passionate about science, she dedicates more pages to Vespa chasing her love interest more than dabbling in the world of science. This type of character can be pulled off, but Trent fails at creating a feminist/scientific dream girl. 2. Point of View: There is an interchanging POV throughout the novel. When you read about Vespa the book is in first person. Yet when the story changes to Cyrus, it switches to third person POV. Unnecessarily confusing? Definitely. It is even more bothersome because Cyrus is not an important character until the last few chapters of the book. 3. 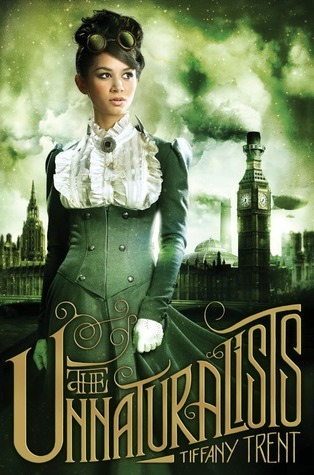 Fascinating yet utterly confusing: Tiffany Trent creates the world of "New London" by mixing science, religion, and Victorian Era themes to give the reader a steampunk world of wonder....sort of. There are many elements of the environment that I loved. Scientists from our world are worshipped as saints at Saint Darwin's Church of Science and Technology. "Myth" is used as energy to power the Industrial Age city. These unique details offer up a world that many readers would have a hard time turning away. Despite this, Trent has large gaps that she expects the reader to fill, making parts of the book completely unbelievable. While I read this book quickly (a sign of an interesting book), it did not rise to my expectations. The sleek cover and catchy synopsis gave me high hopes but I was quickly disappointed. I have a feeling that this series may be one that picks up steam (pun intended) as sequels are produced. If you are wanting to jump into the genre of steampunk, this may not be the book for you. Yet if you want a refreshing tale of magic and science, this is right up your alley. I gave this book 3.5 stars on Goodreads.